I spend a great deal of time in Marquette Michigan. Whether it's visiting with family, hanging out with my bluegrass buddies in Chasin' Steel, attending the Annual Marquette Area Blues Fest with my blues "family", sampling a fine craft brew at Blackrocks Brewery, or incredible Cajun food at Lagniappe, I have always managed to find the "best" in this great city. 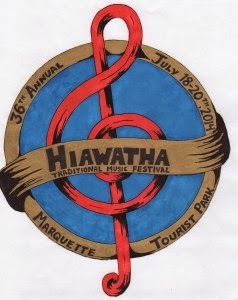 Therefore, the fact that I had NEVER attended the Hiawatha Traditional Music Festival held in the scenic Marquette Tourist Park bothered me to no end. So, this year, I vowed to do something about this oversight and bought my ticket, pointed the headlights north and hit the road, over the bridge to "God's country". And Brother, am I glad I did! First, the setting. I can imagine no better place to hold a music festival. Located right outside of downtown, the Marquette Tourist Park boast seemingly endless expanses of shady camping under towering pines, a first-class swimming beach in the Dead River basin, comfortable expanses of well maintained grass, and wide, well maintained drives and paths to get around. Camper hookups were available, but the majority of camper (myself included) lean towards tent camping. The campground is well maintained, clean and comfortable. Their is ample security present. Trash cans, composting bins, and recycling pickup are everywhere and emptied regularly. This is definitely a "green" event. The grounds are bigger than they appear, and most of the parking is off-site, so a bicycle is a definite plus. There is a super-cool, free, horse-drawn shuttle to the parking lot as well. The quirky main stage is high enough to allow excellent viewing from anywhere, and the staff enforces a "blankets and low chairs" in front rule to keep sight lines open. The stage is centrally located, with a large field where you can leave your folding chairs. The sound system was rather small for my tastes. It was not so much a lack of volume (I understand that they are trying to be good neighbors), but rather a somewhat thin, anemic character to the mix that I found somewhat lacking for an outdoor venue. I caught a couple shows at the main stage and they were thoroughly enjoyable. Overall, the layout is well thought out, with easy access to the food concessions (try the "little Miss Piggy from Dia de los Tacos), art vendors and ample portable toilets. There was a really cool vendor/artist area just off the main stage, with the requisite tie-die and drum vendors, but also some really cool local artists with their work. Prices were reasonable, bordering on insanely low, for some really cool work by incredibly talented artists. A pottery vendor caught my eye with some hand-thrown beer mugs with the UP glazed into the sides, perfect for a basement bar "mug club". A huge, airy tent with wooden floor comprises the "dance tent" (usually called the "second stage" by festival goers). A variety of square-dance, clogging, belly dancing and swing dancing seminars are held all day, with many of the main stage acts serving as the music. With an excellent sound system (courtesy of Jim Supanich at Sombrero Sound), I found watching the acts in this smaller, more intimate setting to be even more enjoyable than the main stage! The Saturday night "teen dance" really worked the crowd into a frenzy, with high octane sets from uptempo bluegrass band Tin Can Gin and a fired-up Dragon Wagon. By midnight, the tent and surrounding grounds were overflowing with crazy teens and adults alike, all jamming to the infectious groove. Really a highlight of the festival for me. Another cool venue at the festival was the workshop tent. Unlike some festivals, these workshops were less "hands on" and more "small artist showcases", where bands played some of their tunes, while providing some narration and the opportunity to interact with the crowd. I saw some incredible performances in the workshop tent, including the swingy, melodic bluegrass-inspired grooves of Frostbitten Grass, the high-energy jamgrass and soaring harmonies of Sparrow Tree, and a trip through the Delta Blues with Hart, Harp and Bones (with my buddy Cody sitting in on his National guitar). There was also a really cool jamming tent set up by the swimming area as well, with some cool open jams, drum circles and some old-timey music. I didn't get to attend many, but they looked like a whole lot of fun! Between the main stage, dance tent, workshops, teen scene, jamming tent and artists area, there was definitely something for everyone at all times during the day. There's even an amazing kids area with hundreds of entertaining, high-quality activities all day long. So, with a day packed full of sunshine, music, great food and interesting people, most people go right to bed after the last show, right? Um...no. This is one of the greatest all-night jamming festival's I've ever been to (except for the "family area" which is respectfully and remarkably quiet all night--an added benefit of the sprawling site layout). Plenty of jams are available to suit any taste. From energetic bohemian young persons sitting on the ground in the dark belting out Green Day and the White Stripes, to old folkies with elaborately decorated (and well lit) jamming tents, there was something for everyone. I sat in on bluegrass, folk, old-time, cajun, blues and fiddle tune jams. I listened to more varieties of music than I can remember, culminating in an accordion/upright bass duo belting out Finnish drinking songs (cool beyond words). Overall, this has to be one of the best festivals I've attended. The music is fantastic, the people friendly, and the site is beautiful, safe and inviting. The vibe is very mellow and fun, and the whole event is very family-friendly. I'll be going back next year, and bringing my daughter with me! To the event organizers I say "really well done" and (of course) "Happy Hiawatha!" The Premier Venue for Roots Music in SE Michigan! 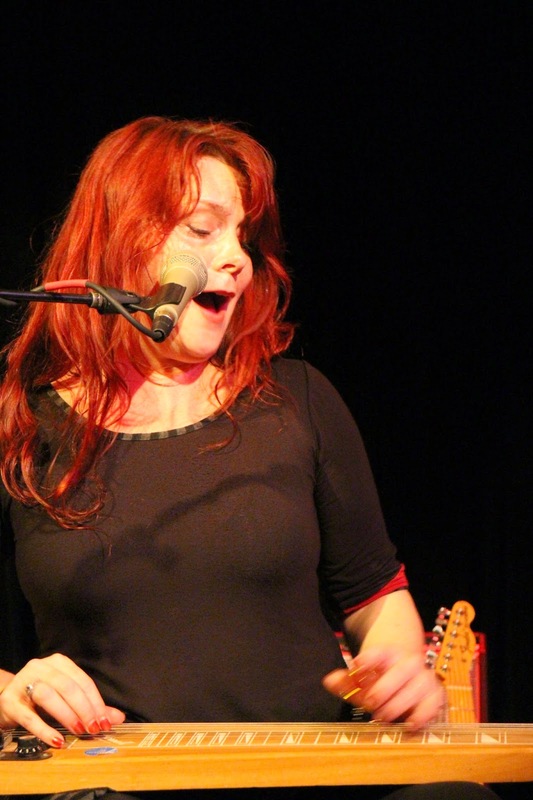 I first encountered the Carolyn Wonderland band at the Marquette Area Blues Festival a couple years ago. While there is no denying that she is a special talent on her own (more on that below), I was truly impressed by her relationship and interaction with her band. It is rare to see three musicians come together so entirely, fall into a comfortable grove and play off each other so completely. 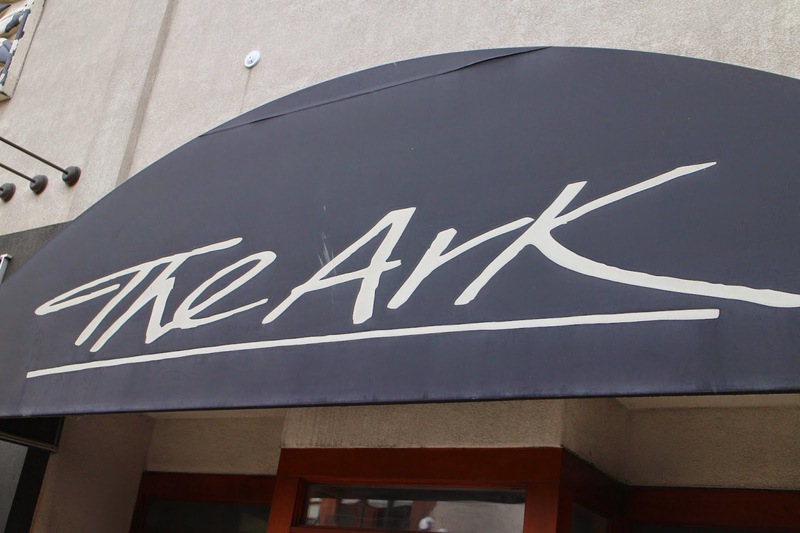 When I saw they were playing the Ark in Ann Arbor (one of the truly great, intimate venues around), it became a "must see" event on my summer music calendar. On the Tuesday of the show, I got home from work and was just getting on my lawn tractor to mow the lawn when I remembered "Holy Cow! I have tickets for the show tonight!" (wow...getting older sure is an adventure). With that said, I threw on a tee shirt and some shorts and hit the road for Ann Arbor. After a weird sour beer and awesome bowl of soup at the Jolly Pumpkin, I headed across the street and was able to snag the first place in line for the show. As usual, met some cool people in line, including a nice couple who I'd seen at a bunch of shows recently and ended up sharing a front-row table with them. With a decent crowd on hand for a Tuesday night, the show started right on time and--from the very first note--I was transfixed by one of the most engaging, high energy performances I have ever seen. From the heels of her authentically Texan boot-clad feet to the tips of her immaculately painted bright red nails, Carolyn Wonderland simply oozes the type of grit and soul that bespeaks countless performances in the honky tonks, speakeasies and back rooms of the blues circuit. It is a rare treat to hear her sing, as she bares heart and soul to the audience; drenching every phrase, lick and note with her full attention. It is the kind of singing that transforms you; pulling you deep into the song and revealing the nuances of meaning behind the lyrics. When each song ended, their was inevitably a moment of stunned silence in the crowd as they struggled to come to grips with what they had just witnessed, followed by enthusiastic applause. The affable and humble Ms. Wonderland seemed genuinely taken back by the response, as if she too were somewhat amazed by the passion with which she sings. This was definitely one of the finest vocal performances I have ever seen. And then there is the Carolyn Wonderland band--and what a band it is. Set up in a small triangle, so that they can see/play/groove off one another, the trio of Carolyn on guitar, Rob Hooper on Drums and Cole El-Saleh on Keys (and a super cool bass emulator keyboard to boot) are simply one of the tightest and most professional bands you will ever see. 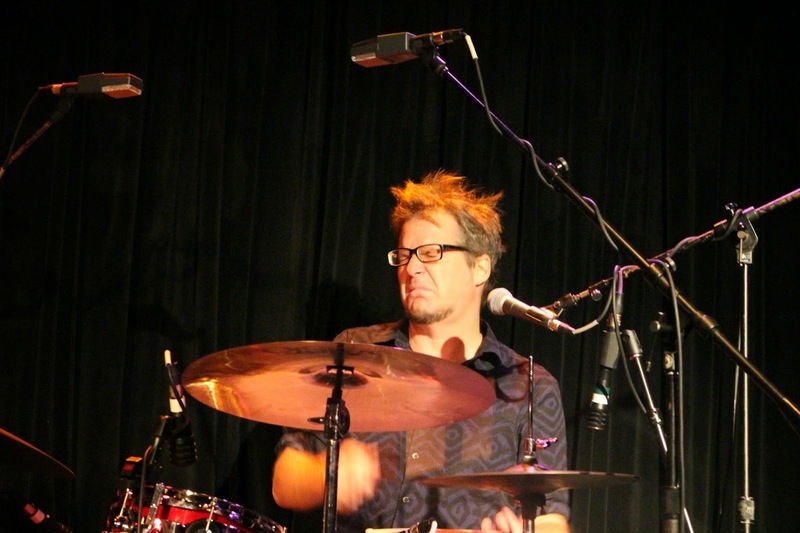 A large man playing a diminutive drum kit, Rob's light touch and lightning-fast hands really drive the band. From thunderous tom, snare and cymbal work, to feather-light touches with brushes (and even claps/finger snaps) the dynamic range with which he plays provides only not drive to the band, but add the depth and character so often missing in live performances. 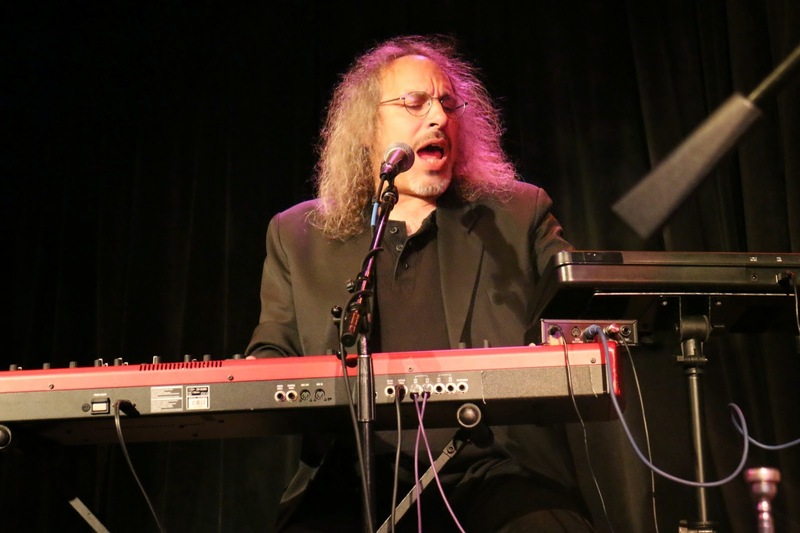 With his Lennon-esque glasses and flowing hair, Cole El-Saleh is the epitome of cool. Couple that with the fact that he plays one of the finest keyboard lines around AT THE SAME TIME he plays a fantastic bass line, and it is soon evident that he can back up those cool looks with old-fashioned musical bad-assedness as well. On top of all this, both Cole and Rob contribute killer background vocals to the band sound. 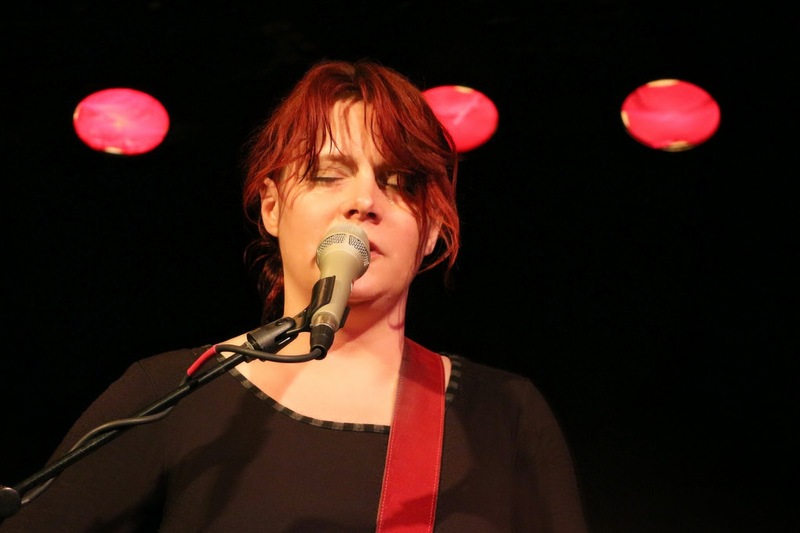 Their soaring two- and three-part harmonies are able to stand up to Carolyn's powerful and soulful lead, transporting the listener above the lyrics and burying them in the groove of the song. 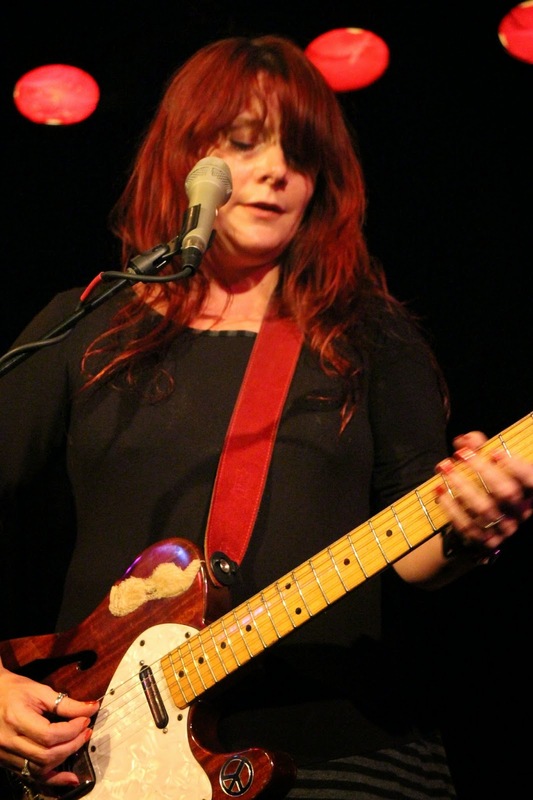 I can only imagine one guitar sound that could possibly stand up to the power of the vocals in the Carolyn Wonderland band and that is the dirty, twangy sound of a Telecaster played with the bridge pickup selected. 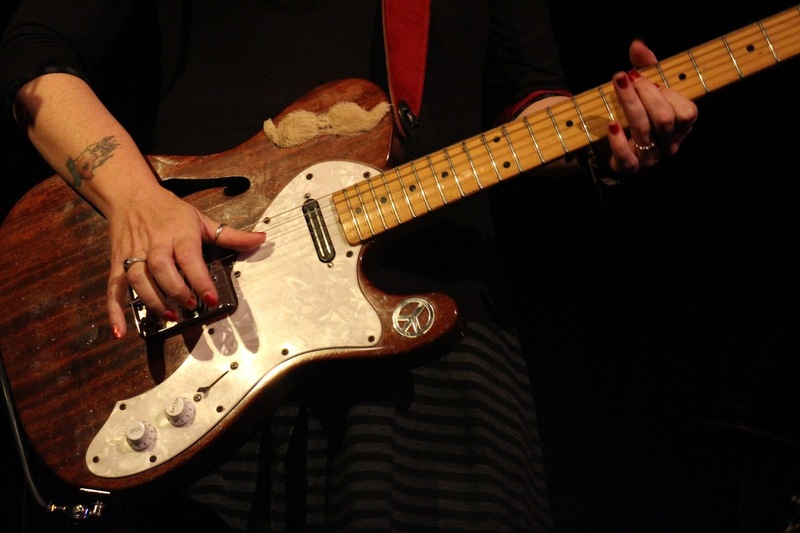 In addition to her stunning vocal work, Carolyn Wonderland is also an incredible guitar player, coaxing the most amazing tone and texture from her Thinline Tele. Like it's owner, the guitar drips personality, sporting a fur mustache and reflective peace sign, and a cigarette burn between the nut and first tuning machine that adds just the right amount of "street credibility". Like all my favorite blues guitarists, she eschews the complexity of multiple effects pedals, instead using her hands (and sometimes a little "body English") to coax the sounds she wants from her instrument. During the set, Carolyn also featured some slide work, choosing the lap steel over the tele for a fuller, darker sound. To close the first set, she even brought the crowd to the Texas-Mexico border with a Latin inspired number sung in Spanish and accompanied by--of all things--some hot licks on the Trumpet. 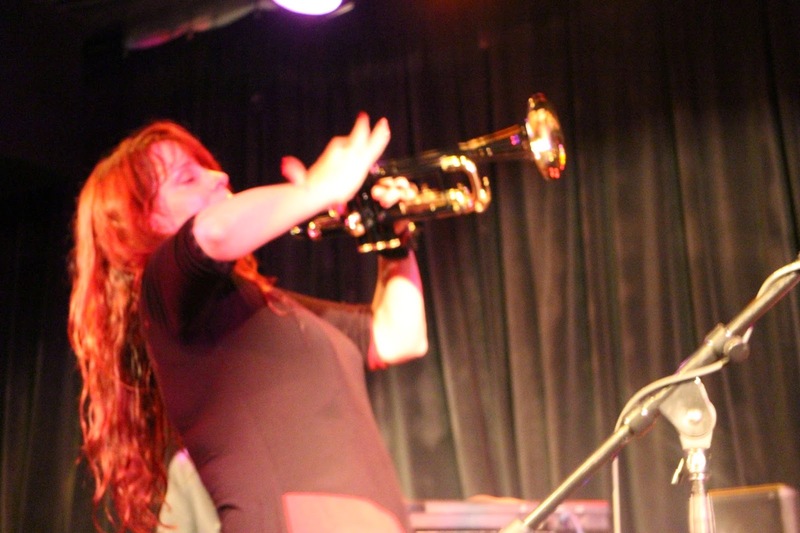 No matter how many times she shifted gears, the band found a way to grab hold and hang on, always adding to the sound and keeping the pocket and groove alive. Truly one of the finest overall performances I have seen at the Ark (and that's saying something! ).